Like many of his generation, Richard Deacon adopted Marcel Duchamp’s proposition that titles were an extra colour on the artist’s palette. In using language in this way the younger artists of the 1970s put distance between themselves and the abstract artists who came before them (who often labelled everything ‘Untitled’). 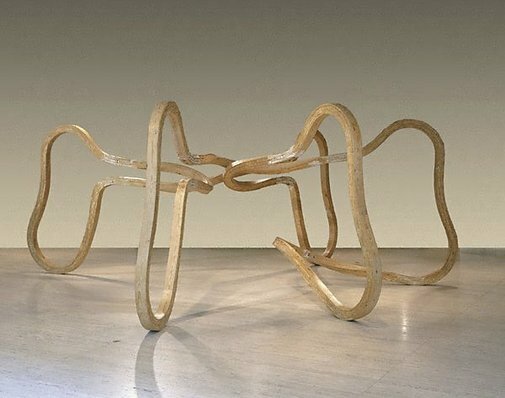 ‘Listening to reason’ is a case in point.1 The shape of the work describes five double loosely ear-shaped curves, connected by twisting pieces of laminated wood to make one continuous line. The title encourages us to think of a circle of people listening to an argument, each connected to the other but all slightly differently. It is far from being a symmetrical form; each section is joined by twisting connections that appear to be arranged at random. The line is made up of multiple layers of laminated ply, which have been glued together in sections and clamped onto forms that give them their twisting motion. Deacon has left the hardened glue that squeezed out of the laminations as a trace of the process, thereby adhering to a principle of truth to materials and processes. The plain, glowing yellow surface of the ply against the beige colour of the glue in the side grain of the wood helps to reveal the twisting body of the loops. The sections were then bolted together through offset joints, once again making a virtue out of the visible process to articulate the form. Majorie Allthorpe-Guyton, Richard Deacon , 'Listening to reason', pg.41-46, London, 1988, 45, 46 (illus. ), 77 (illus.). This work is not in the exhibition but is referred to and illustrated in the catalogue. Anthony Bond and Victoria Lynn, AGNSW Collections , 'Contemporary Practice - Here, There, Everywhere ...', pg. 229-285, Sydney, 1994, 247 (colour illus.). Anthony Bond, Look , 'Rehang of Level 2 June 2012', pg.28-30, Sydney, May 2012, 29, 30 (colour illus.). Anthony Bond, Look , 'Marriage rites', pg.28-31, Sydney, Jul 2008, 30-31 (colour illus.). Anthony Bond, Contemporary: Art Gallery of New South Wales Contemporary Collection , 'Objects and associations', pg.332-381, Sydney, 2006, 346, 347 (colour illus.). Bruce James, Art Gallery of New South Wales handbook , 'Western Collection: Paintings and Sculpture', pg. 17-77, Sydney, 1999, 76 (colour illus.). Paula Latos-Valier, Biennale of Sydney 2000 , 'Looking back: the biennale of Sydney 1973-1998', pg.160-190, Sydney, 2000, 179 (colour illus.). This work is not in this exhibition but is illustrated in the catalogue. Unknown and Unknown, Prospect 86 , Frankfurt am Main, 1986. From caves to canvas: an introduction to western art (Second edition) , 'Art of the '80s: Graffiti, New Expressionism, Post -'70s Architecture', pg.337-363, Sydney, 1998, 358 (colour illus.). Richard Deacon , London, 1995, 40-41 (colour illus.). Richard Deacon , New York, 1988, (illus.). figure 5, this work is not in the exhibition but is referred to and illustrated in the catalogue.